Because of the immense complexity of the eye, surgery is a complex procedure requiring extreme care throughout the procedure with a lot of planning beforehand by expert eye surgeons known as ophthalmologists. There are a few different reasons one might opt to have eye surgery, including cataracts, vision impairment, glaucoma, eye muscle problems and even eyelid problems. Because of the nature of the procedures, after eye surgery a strict and important post operation routine is necessary. While eye surgery is generally safe and complications are few and far between, as with any major surgery, the possibility exists that complications may arise. This could include persistent inflammation, infection, changes in eye pressure, retinal swelling and retinal detachment. Depending on the surgery there could be surgery specific side effects like in the case of cataract surgery, the artificial lens might move or might not function properly, in which case it would need to be moved, repositioned, replaced or removed altogether. It is important that if at any stage you notice your vision is deteriorating, even a little, to consult the ophthalmologist that performed the surgery for you and arrange for him to have a look at your eye as soon as possible. 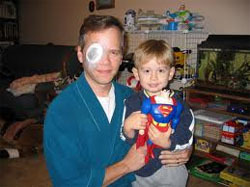 Depending on which eye surgery you need, after eye surgery procedures will differ. The first thing you’ll need to do is organise a lift home as most hospitals and eye clinics will insist someone fetch you as your vision can and usually will be impaired after eye surgery. Your ophthalmologist will recommend you take frequent naps, use normal painkillers for pain, wear sunglasses and avoid going into sunlight and any bright light sources, wear eye shields while sleeping and most importantly do not rub or touch your eyes, no matter how itchy they feel. Your eye surgeon will normally prescribe some antibiotics and anaesthetic eye drops for you to use after surgery. You won’t need a cabinet full of medication as your eye should heal very well on its own and within the first 24 hours after eye surgery, your vision should be must clearer – clearer in fact than before the surgery. On average, patients after eye surgery rarely suffer with pain and discomfort for long, but as with all surgeries, very often a follow up appointment or two will be scheduled by the hospital or clinic you went to. The most important thing you can do, if you do have any questions or concerns after eye surgery is to contact your ophthalmologist.